Everything I say may appear slightly contrarian when viewed using the COT index as an indicator but the British Pound is a good example at present which I hope will make the point with a little explanation. 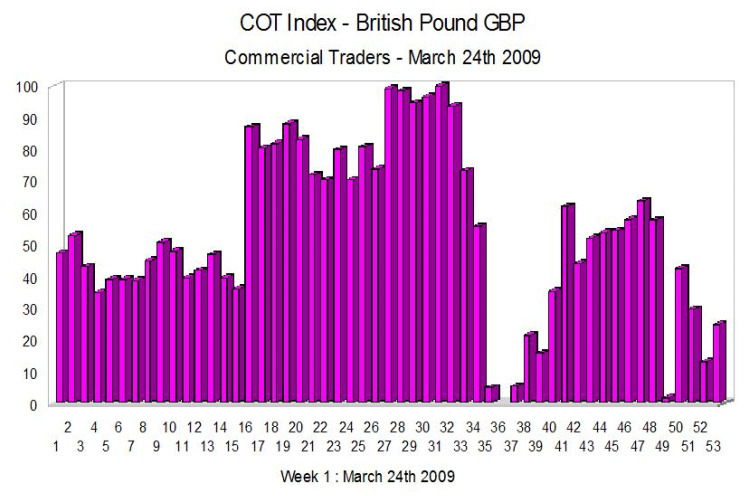 At present the Commercial futures holders are net long and have been for some time even whilst the pound has been falling heavily in the spot market which may seem odd at first glance. However, if we stop and think for a moment about the nature of the commercial holders, these are institutions with very deep pockets who are taking long term view of the market and are therefore building their positions by buying at what they consider to be a low price with a view to selling the contracts in the 12 to 18 months once the pound has recovered. All of the above merely highlights the timeframes one is dealing with when viewing the COT index; it is not a timing indicator as such but much more a sentiment and direction indicator for the longer term. The extremes of the chart, whether zero or 100 are the points at which the sentiment shifts in the commercial holders and at which point we may expect to see a change in price direction in the spot market in the following period.